Don’t miss the diversity of lichen that provide a colorful cover for many surfaces across the world. 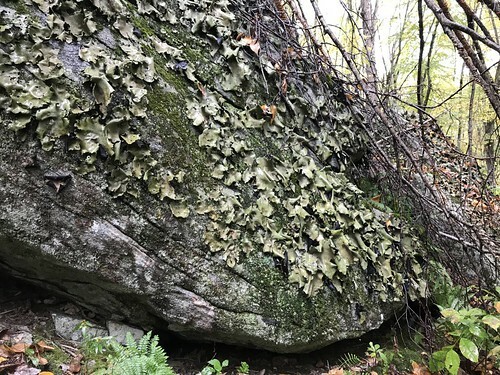 During a fall hike in Massachusetts, I was scaling a hillside with a group of friends when we came across a rocky outcropping that looked like it had been camouflaged in dark green and gray netting. As we got closer, we realized it was a living, breathing organism - lichen! I normally notice lichens growing in small flakes on rocks or trees, but I had never seen lichen as large as this (Fig. 1), so I decided to learn more about the complex diversity of these organisms. Lichens are actually comprised of two organisms - a fungus and photosynthetic bacteria. The fungus provides a home for the bacteria, and in return feeds off of the sugars produced by the bacteria through photosynthesis . The fungi and bacteria depend on one another to survive, and thus comprise one entity known as lichen. 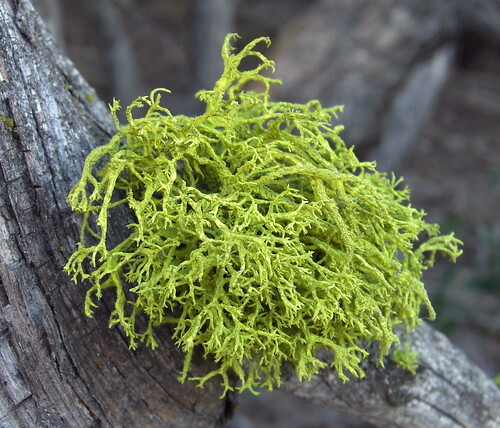 Many different types of lichens live in diverse habitats from hot and dry deserts to moist and cool forests. Lichens play an important role in some of these ecosystems, such as the lichen living on biological soil crust in the deserts of Utah (Fig. 2). These complex bacterial communities mediate the movement of energy between desert soils and the atmosphere above them by converting nutrients, water, and light into energy. Ecosystems with limited resources therefore rely on lichens and the other members of biocrust communities to maintain an energy balance. 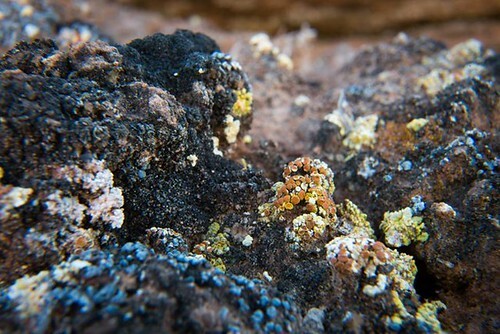 As a result, biocrust has earned the title of the earth’s “living skin” . There are four main groups of lichens aptly named for their appearance - crustlike, pebble-like, leaf-like, and free-standing lichen . The lichen I found in Massachusetts is a type of leaf-like lichen called ‘rock tripe’. Lichen range in color and the surfaces they colonize, although they most commonly occur on rocks and tree bark. These organisms have specialized structures that help them stick to the fine nooks and crannies of surfaces, much like how most plants stick their roots into the ground . Thousands of species of fungi can make up one half of a lichen, but only around 100 species of bacteria can be part of this relationship . Even so, the partners that form lichen are tightly linked throughout their lives and even in reproduction. Lichens disperse by releasing clusters of bacterial cells that are wrapped in fungal filaments, which are threadlike structures that make up the body of the fungus . Basically - lichens shoots off mini balls of lichen to colonize new areas. Lichens are some of the many organisms that make up an ecosystem, and they’re not so bad to look at either! Next time you’re out and about, see how many different types of lichen you can find. De Santis, Salvatore. “An Introduction to Lichens.” The New York Botanical Garden. Last modified 1999. https://www.nybg.org/bsci/lichens/. Weber, Bettina, Budel Burkhard, and Jayne Belnap. Biological Soil Crusts: An Organizing Principle in Drylands. Switzerland: Springer, 2016. Speer, B.R. and Ben Waggoner, “Lichens: Life History & Ecology”. University of California Museum of Paleontology. Last modified 2006. http://www.ucmp.berkeley.edu/fungi/lichens/lichenlh.html. Vidyasagar, Aparna. “What Are Lichens?”. Live Science. Last modified June 8, 2016. https://www.livescience.com/55008-lichens.html. Deacon, Jim. “The Microbial World: Lichens”. Institute of Cell and Molecular Biology, The University of Edinburgh. Accessed November, 2018. http://archive.bio.ed.ac.uk/jdeacon/microbes/lichen.htm.